Two men accepted plea bargains with prison time Tuesday after each was charged with dozens of counts of involuntary manslaughter in an Oakland warehouse fire that killed partygoers at an unlicensed concert. 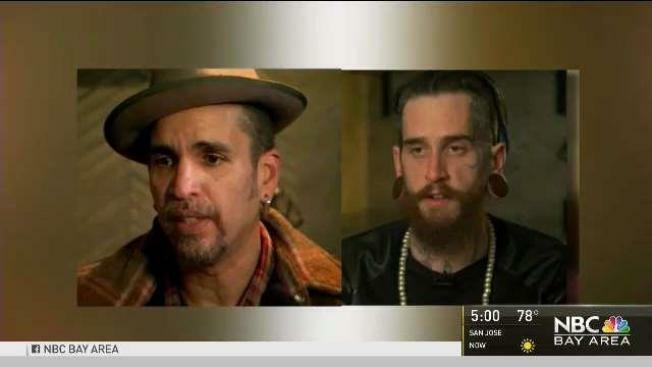 Derick Almena, 48, and Max Harris, 28, accepted the agreements in exchange for prison sentences. Under the terms of the agreements, Almena could be sentenced to nine years in prison and Harris could receive a six-year sentence. A judge is scheduled to sentence them on August 9 and 10. Authorities say Almena rented the warehouse and illegally converted it into an entertainment venue and residences before the December 2016 blaze. Harris helped Almena collect rent and schedule concerts. Both men are only expected to serve half their sentences. They have been in jail for a year. Almena's attorney Tony Serra said Almena agreed to the plea bargain to alleviate "the pain and suffering of all parties." Prosecutors say the men turned the cluttered building into a "death trap" with few exits, rickety stairs and dark and dangerous passageways. Bureau of Alcohol, Tobacco and Firearms investigators said they could not determine the cause of the blaze. Each man was charged with one count of involuntary manslaughter for each person who died in the fire that quickly destroyed the structure during an electronic music performance. David Gregory, whose 20-year-old daughter, Michela Gregory, was among the victims, said he was shocked that the sentences were so short. "These people are going to be out in a few years and walking the streets," he told the San Francisco Chronicle. "They're getting a sweet deal, and they're going to do easy time." Sami Kopelman, the mother of 34-year-old victim Edmond Lapine, said also thinks the sentences are too lenient. She said she would have liked to see each defendant get 36 years in prison, one year for each life lost. "I don't want my son's life or those of the other victims, no matter what their circumstances were for being there, I don't want the value of their lives to be lessened by a sweep aside," Kopelman told the East Bay Times. The sentences appeared to be "fair and reasonable" given the charges of involuntary manslaughter, Stanford University law school professor Robert Weisberg said. A typical manslaughter case often results in shorter sentences, he said, citing the three-year sentence given to a transit officer in the region who mistook his gun for a stun gun and fatally shot a passenger. 'On the other hand, there were 36 victims," Weisberg said about the warehouse fire. "This was a manslaughter case that felt like a murder case." Almena lived in the warehouse with his wife and three children. The family was staying in a nearby hotel on the night of the fire. Harris also lived in the warehouse and escaped the fire unharmed. Serra said a plea deal will spare the victims' families from testifying at a trial where photos of burned bodies and other emotionally fraught evidence would be shown.